The weather is warm and the flowers are in full bloom; this is the season for sandals, sunscreen and – for many of us – allergies. Outdoor allergies such as pollen and ragweed affect millions of people each allergy season but indoor allergies to substances like pet dander and dust can torment allergy sufferers throughout the year. While we often associate allergies with sneezing or skin rashes, they can also impact the health of our eyes. The most common type of eye allergy is allergic conjunctivitis, a condition that results from the immune response set off by our bodies coming into contact with an allergen. When this occurs, the immune system produces immunoglobulin (IgE), antibodies which trigger cells to release histamine, the chemical responsible for allergic reactions. This histamine response results in eyes characterized by redness, tearing, itching or puffy eyelids. It is also common to experience dilated vessels in the conjunctiva, the thin clear membrane covering the eyelids and white part of the eye (sclera). Other symptoms include stringy eye discharge, burning and sensitivity to light. People who suffer from chronic allergic conjunctivitis may have persistent dark circles known as allergic shiners. Allergic conjunctivitis is not communicable and cannot spread from one person to another like bacterial or viral conjunctivitis. Eyecare providers can usually diagnose allergic conjunctivitis easily. Using a slit lamp microscope, an ophthalmologist can identify signs of allergies, like enlarged blood vessels on the eye’s surface. Eye specialists will also look for small raised bumps on the inside of the eyelids (papillary conjunctivitis) or perform a simple, non-invasive test for eosinophils, a type of white blood cell that appears in areas of the eye affected by allergies. Patients will also be asked to provide a family history of allergies, if any, to determine whether there is a genetic link. Avoiding contact with the allergen is the best treatment for allergic conjunctivitis; it’s also often impossible. Fortunately, there are a variety of treatment options for those who suffer from eye allergies. Artificial tears can reduce eye dryness by adding moisture and washing allergens from the eye. Antihistamine/mast-cell stabilizers are eye drops with both a mast-cell stabilizer to help prevent eye allergies and an antihistamine to relieve itchiness. Prescription eye drops such as Patanol, Optivar and Pataday can also help soothe watery, itchy eyes caused by allergic conjunctivitis. In addition to allergic conjunctivitis, there are three other primary forms of eye allergy. Vernal keratoconjunctivitis is much more severe than allergic conjunctivitis and occurs primarily in boys and young men. Most patients suffering from this disease also suffer from asthma or eczema and experience the sensation of having something in the eye (foreign body sensation) and an aversion to light (photophobia). If left untreated, vernal keratoconjunctivitis can impair vision. Atopic keratoconjunctivitis results in similar symptoms, but mostly affects older males with a history of allergic dermatitis. If left untreated, it may result in scarring of the cornea. Lastly, giant papillary conjunctivitis is a form of eye allergy linked to wearing contact lenses. Symptoms include tearing, puffiness, mucous discharge and difficulty wearing contact lenses. 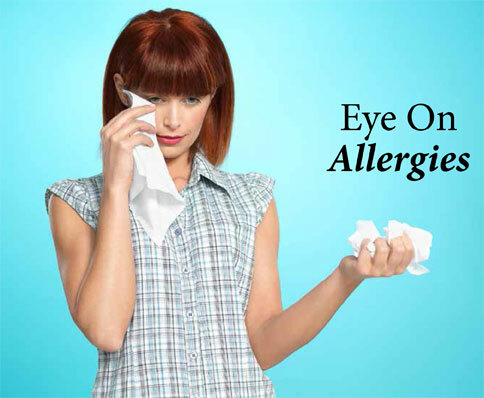 While avoiding allergens is the best way of staying allergy-free, eyecare professionals (ECPs) don’t necessarily have to advise patients to give away the cat or avoid Mother Nature. Encourage clients to make an appointment so they can find out how to treat allergies with over-the-counter or prescription treatments such as eye drops or oral antihistamines. The client may even be a candidate for immune therapy, which will gradually increase immunity to allergens. Thankfully, giving Fluffy away is seldom necessary.